* Within three minutes, a semisweet grapefruit and citrus comes in with a bit of spice. * The fruits mix and stay at the forefront, and a faint flower starts to come in. * The original Dior Homme was an iris-based scent – so I am guessing the flower is a muted iris. * The long-lasting base of amber woods lasts a really long time. 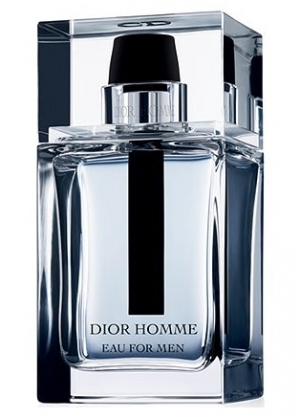 Summary: Dior Homme Eau For Men is a safe and solid designer men’s fragrance. It is easy to wear, accessible, and will work for a lot of people. I think it is better than most department store scents because what you smell on top is pretty similar to what you smell throughout the life of the scent and it lasts more than twelve hours. Fans of scents like Chanel Blue and Dior Light Blue would do well to check this one out. It is office-friendly and will no doubt be very popular as I’ve already smelled it on guys at the club several times. The glass bottle is also quite attractive – in a modern masculine minimalist way with the black tube accent giving it a visual exclamation point. This is one of those times when I appreciate a fragrance for its merits while realizing that it is not something that I personally would reach for. Dior Homme Eau for Men is available at Macy’s. Disclaimer: Sample received from publicist. Image courtesy of Fragrantica.